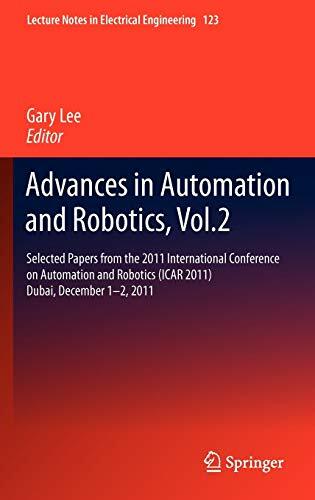 [PDF] Advances in Automation and Robotics, Vol.2: Selected papers from the 2011 International Conference on Automation and Robotics (ICAR 2011), Dubai, ... (Lecture Notes in Electrical Engineering) | Free eBooks Download - EBOOKEE! Description: The international conference on Automation and Robotics-ICAR2011 is held during December 12-13, 2011 in Dubai, UAE. The proceedings of ICAR2011 have been published by Springer Lecture Notes in Electrical Engineering, which include 163 excellent papers selected from more than 400 submitted papers. The conference is intended to bring together the researchers and engineers/technologists working in different aspects of intelligent control systems and optimization, robotics and automation, signal processing, sensors, systems modeling and control, industrial engineering, production and management. This part of proceedings includes 82 papers contributed by many researchers in relevant topic areas covered at ICAR2011 from various countries such as France, Japan, USA, Korea and China etc. The session topic of this proceeding is signal processing and industrial engineering, production and management, which includes papers about signal reconstruction, mechanical sensors, real-time systems control system identification, change detection problems, business process modeling, production planning, scheduling and control, computer-based manufacturing technologies, systems modeling and simulation, facilities planning and management, quality control and management, precision engineering, intelligent design and manufacturing. The papers in this proceedings focus on industry engineering to promote efficiency and affect for the world, which typically showed their advanced research work recently in their various field. I am sure that discussing with many colleagues will give much more creative idea for each other on ICAR2011. All of papers with powerful evidence and detail demonstration involved the authorsâ€™ numerous time and energy will be proved valuable by their unexhausted exploring sprit. Sincere thanks to the committee and all the authors, in additionally, including anonymous reviewers from many fields and organizations. They pointed out us direction to go on research work for the world. No comments for "[PDF] Advances in Automation and Robotics, Vol.2: Selected papers from the 2011 International Conference on Automation and Robotics (ICAR 2011), Dubai, ... (Lecture Notes in Electrical Engineering)".